I never buy art, but this painting called to me in a voice I couldn't resist. Its name is Lynx Lynx and from the moment I saw it I knew I wanted to own it. (Somehow the word "own" seems petty and impossible. Can anyone really OWN art?) Anyway, I knew I wanted to be able to look at it every day because it fills me with happiness and an irrepressible smile every time I do. It's an encaustic painting (which I had to be told) and the artist is Georgia Schnore. She is 12, and I hope she keeps on making art for the rest of her long, long life. I can't explain how happy this makes me; it's a wonderful thing. There may be one more reason why I am so fond of this painting. I hope you understand how much buying art from a budding VERY YOUNG artist means to them. Their confidence, their exuberance, their persistence. And it is a beautiful piece (yes, you can definitely OWN art). Seven looks happy with the painting, too! Seven will be happy to answer any further questions you may have about 'ownership' - her expression says 'mine' loud and clear. Portrait of the multi-talented artist: http://www.flickr.com/photos/williemaerockcamp/1623014216/ (on keyboards a couple of years ago), and also http://www.youtube.com/watch?v=GZS7By_x5FQ with the fashionable scarf (I think she's more often seen on drums). I completely get why you couldn't walk away form Lynx Lynx. It's marvelous. I would never, never steal anything form your house. In fact, I'm sure I've lost the keys. Would you trade it for the yucca painting? Elizabeth, when you look at this in combination with the cow William made it makes sense, doesn't it? Sara, thanks for the links; it's nice to put a face on the artist. Mark, no, not even for the yucca. And the painting is at the apartment (not the house), where the doormen have instructions to search your bags as you leave! 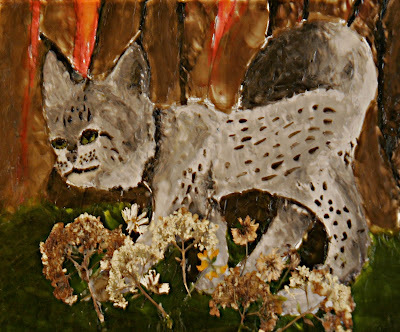 Ellen, Georgia found your blog and was so excited to see that you love the painting. She asked me to post for her to tell you that she is happy that the Lynx Lynx is in a good. home.